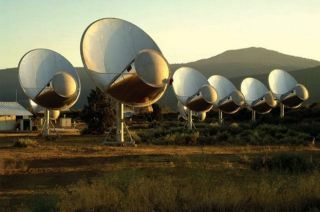 The Allen Telescope Array at the Search for Extraterrestrial Intelligence (SETI) Institute has been listening for signals that may indicate that sophisticated alien civilizations are trying to communicate. A recently detected SETI signal could end up being this generation's version of the famous "Wow!" signal of 1977: an intriguing mystery that keeps astronomers guessing for decades. In May 2015, a team of researchers using a Russian radio telescope spotted a strong radio signal coming from the vicinity of the sunlike star HD 164595, which lies 94 light-years away from Earth. "If they can't find it again, and if we [at SETI] can't find it, all we can say is, 'Gosh, I wonder what it was,'" Shostak told Space.com. That's pretty much all that astronomers can say about the Wow! signal, a 72-second-long event picked up by the Big Ear radio observatory at The Ohio State University in August 1977. The 1977 signal received its name after a volunteer astronomer named Jerry Ehman wrote "Wow!" on a computer printout of the signal's transmission record. Ehman made the comment after finding the radio signal was 30 times stronger than background emissions. Astronomers never discovered any evidence linking the Wow! signal to an alien civilization, and, despite recent efforts from the SETI Institute, a repeat detection of that signal has not been made. Researchers did conclude the signal was coming from the direction of the constellation Sagittarius. When volunteer astronomer Jerry Ehman found that a signal detected in 1977 was 30 times more powerful than the average radiation from deep space, he wrote "Wow!" on the computer printout, as photographed here. The May 2015 and Wow! signals are analogous in another way, Shostak said: Both seemed to appear and then disappear quite quickly. This doesn't seem consistent with a signal from an orbiting satellite, which would be in range of the radio telescope for longer stretches, he said. "The thought is: Well, that wouldn't be a satellite. A satellite would be on, and maybe it'd be on for a minute or something like that. It wouldn't just go up and down right away," Shostak said. Astronomers know that HD 164595 houses a roughly Neptune-mass world, but this close-orbiting planet is likely far too hot to host life as it exists on Earth. But it's possible that other planets lie undiscovered in the system, Shostak said. The team of astronomers who spotted the May 2015 signal apparently studied the HD 164595 system 39 different times but made just the one detection, Shostak said. The detection team has not yet published a study of its findings. Instead, the researchers plan to discuss the signal next month at the 67th International Astronautical Congress (IAC) in Guadalajara, Mexico. The detection of the May 2015 signal was made public on Aug. 27 by Centauri Dreams' Paul Gilster, who wrote that one of the astronomers on the detection team forwarded him the IAC presentation. In hopes of learning more about this possible extraterrestrial signal, astronomers from the SETI Institute focused the Allen Telescope Array in California at HD 164595 Sunday night (Aug. 28) and Monday night (Aug. 29), Shostak said.